During the years 2000 - 2007, while studying and working as a visual artist, I spent time with family in Israel. I became fascinated with two sacred sites in Jerusalem and how an ancient stone wall functions as a membrane between separation and unity - thus my project Three Hundred and Sixty Degrees of Separation was born. As the project developed I began to theorise my work through the themes of identity and difference. As the circularity of the title suggests, the work encompasses both poles of this dichotomy within its wide embrace. On the side of difference live the other and the stranger. But the stranger is never strange to himself. Present to himself, he is strange to another. In this way the movement between strangeness and the presence of identity produce a journey. This journey moves through 360 degrees - a movement in which the conditions of separation and unity coexist. Three Hundred and Sixty Degrees of Separation traverses across a range of media: drawing, etching, animation, video, writing. Scroll down to view the work. Read more about Three Hundred and Sixty Degrees of Separation. These etchings depict 360 degree views of two sacred sites in Jerusalem. Using the Jerusalem Etching plates additional imagery has been layered using paper masks and blind embossing. These prints are made from one alluminium plate taken through 25 states. 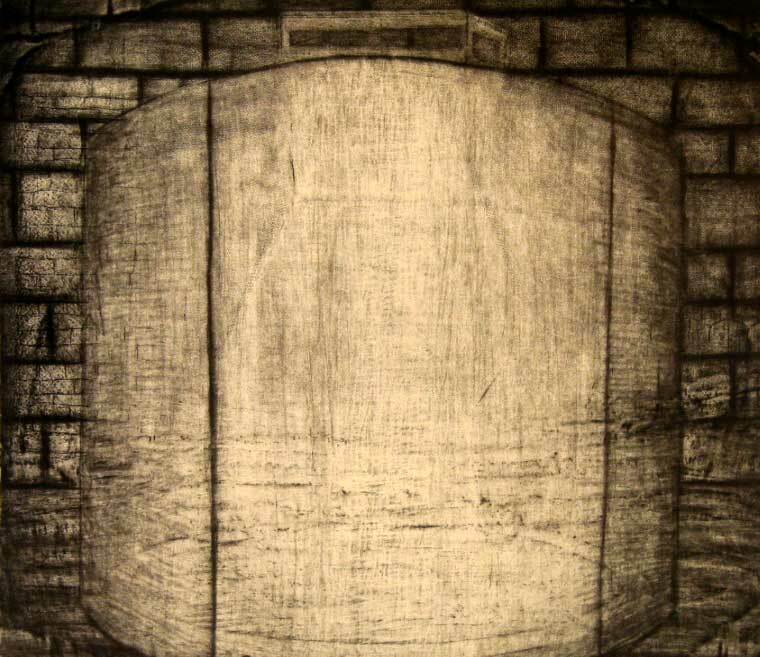 Featuring the Jerusalem Etchings and Paper Masks exhibited on two sides of a hanging wooden ring.